Whether you’re hosting or invited to a summer cookout, barbecue, or potluck, you’ll need a stash of easy-to-prepare and colorful cold dishes to share — and to help lure your friends to the plant-based side! Featuring plenty of summer produce, these room-temperature dishes are designed to impress the guests while keeping it easy on the cook. All of these are fantastic accompaniments to our Vegan Barbecue offerings. 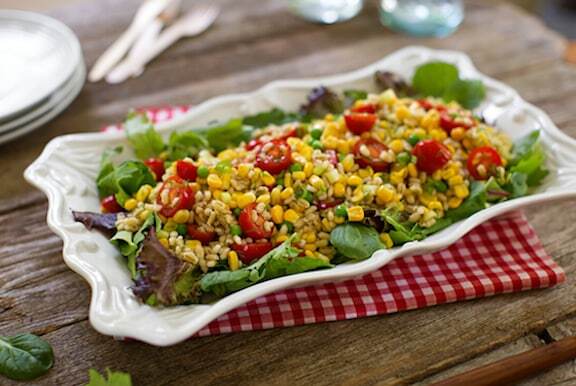 Barley and corn are a companionable duo in Barley Salad with Fresh Corn and Peas. Shown above, it’s a simple and hearty cold dish that’s a great choice to serve at potlucks and picnics. 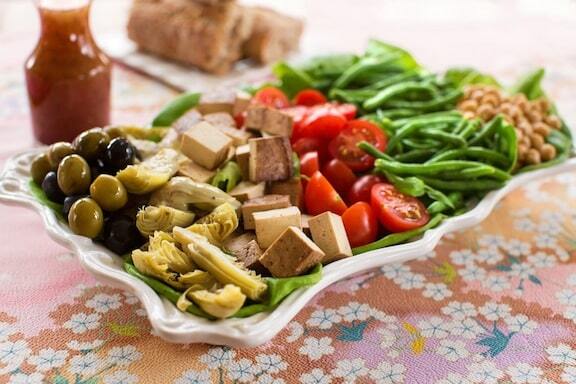 Vegan Salade Niçoise, at top, is a beautifully composed French-inspired platter that looks fancy but is incredibly easy to make. The traditional version is often made with tuna, but here the fish is replaced with baked tofu, which makes a great stand-in. And the array of ingredients—white beans or chickpeas, slender green beans, tomatoes, and olives—makes it a splendid main dish salad for a summer meal, either on busy weeknights or festive occasions. 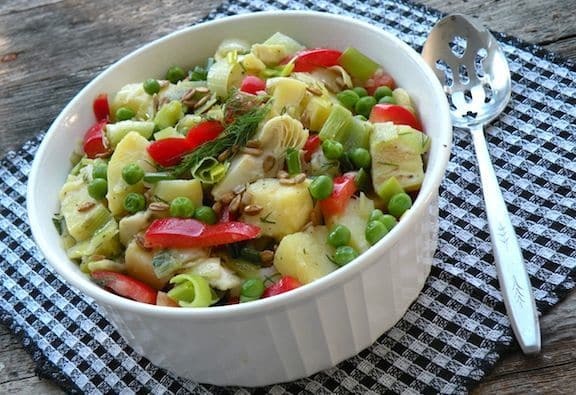 Luscious Potato and Leek Salad is a dressed-up potato salad that’s easy to make, with the warming touch of leeks. It’s great with grilled dishes, and is a nice potluck or company dish for summer. 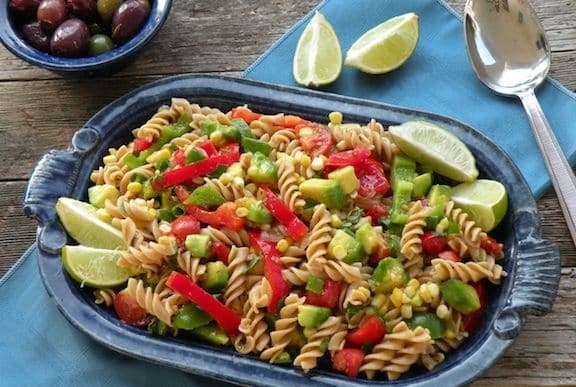 Southwestern Pasta Salad with Avocado, Corn, and Peppers has a delectable southwestern flavor. It makes a great companion to grilled veggies and plant proteins. Classic three-bean salad gets a modern twist with balsamic vinegar, cilantro, and sunflower seeds. 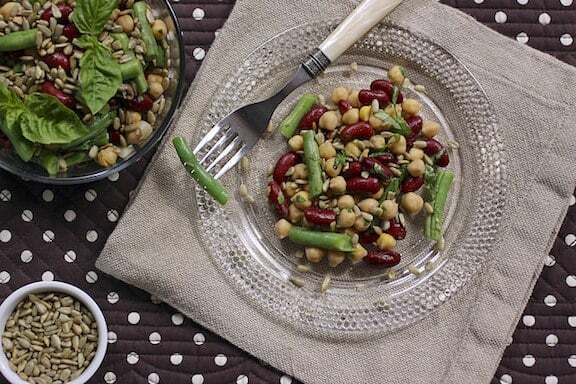 Contemporary Three-Bean Salad is a special favorite to serve with summer outdoor meals and your plant-based barbecued proteins. 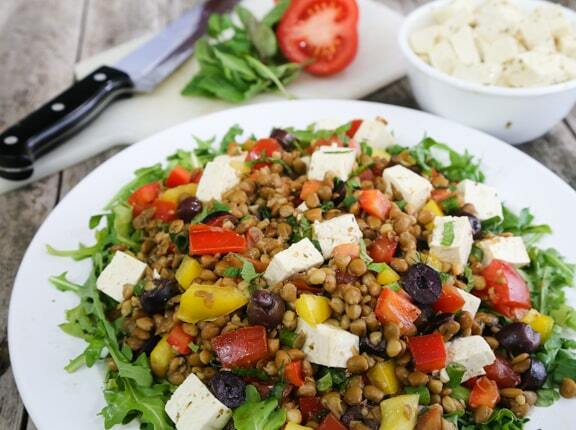 Hearty Greek-Flavored Lentil Salad with Tofu “Feta” is easy enough to make for everyday meals, and impressive enough to serve on special occasions. It’s a sturdy dish to bring to your summer gatherings. Cold Soba and Cucumber Salad is delicious even without the parsley or cilantro sauce, though I highly recommend it. 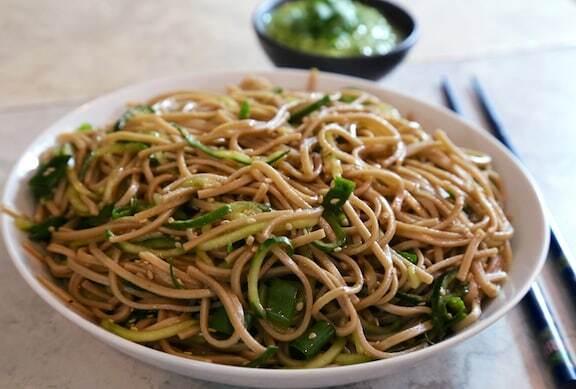 Hearty soba (buckwheat) noodles mingle with refreshing cucumber, and as an added bonus, these noodles are naturally gluten-free. 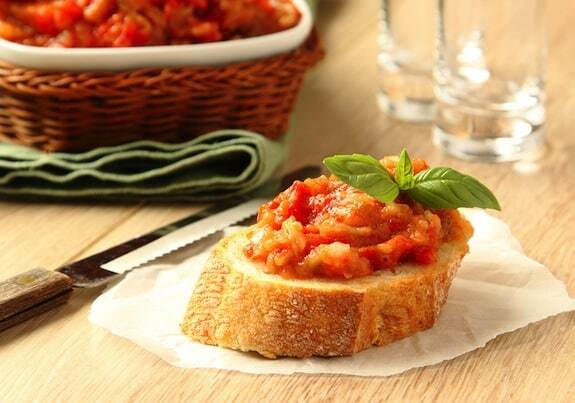 If you’ve been asked to bring an appetizer to your summer gathering, might we suggest this tasty, season-appropriate Eggplant and Tomato Spread? Featuring eggplant with a hint of tahini, it’s reminiscent of baba ghanouj, but with the summery flavor of tomatoes. Pick up some fresh bread to serve with it — olive bread makes it even more heavenly. Last but not least,let’s say you’ve been tasked with providing dessert for your summer potluck or barbecue and you don’t feel like turning on the oven. 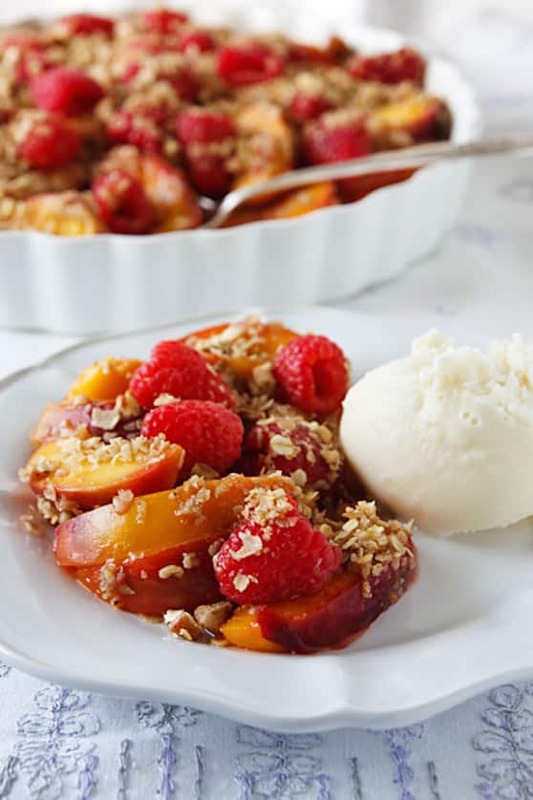 Unbaked Peach-Berry Crumble is a fantastic choice; serve with vanilla nondairy frozen dessert, and you’re all set.